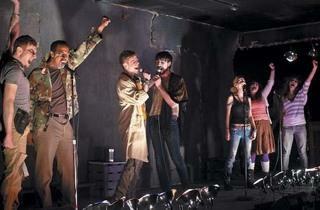 A new concert-style musical presents a dystopian story line that gets lost in the glam-rock sound mix. 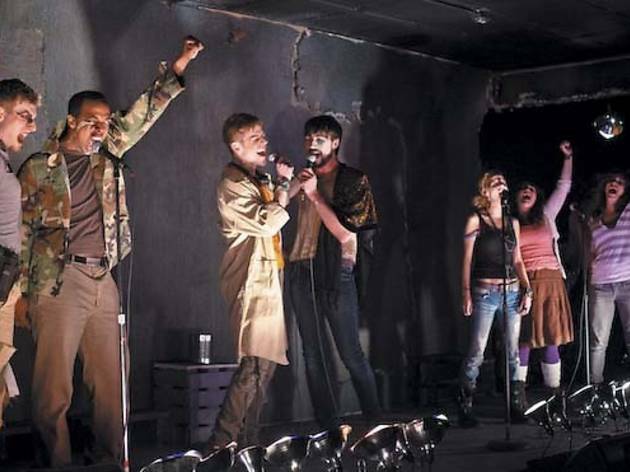 Take the disenfranchised pop-punks of American Idiot, put them in Ziggy Stardust makeup and relocate them to a Hunger Games–like dystopian America. Turn the volume all the way up, and you have the formula for this new concert-style musical, a collaboration between the New Colony and Bailiwick Chicago. Set 25 years after the start of the second Civil War, the story follows the Numberless, a group of underground freedom fighters (or terrorists, depending on whom you ask). They risk death to perform their history, a musical chronicle that would be a lot more effective if the majority of the lyrics weren’t buried under booming instrumentals. Director and cowriter Andrew Hobgood makes some confounding structural choices, breaking up the concert’s momentum to bring attention to the dangers outside. The final musical number is interrupted in an effort to raise the dramatic stakes, which instead sacrifices a satisfying conclusion as the audience is escorted out of the theater. Through their howling vocals, Harmony France and Samantha Dubina channel the spirit of such rock goddesses as Pat Benatar and Heart. Ryan Lanning not only sings above the band, but does so with a flashiness that wonderfully toes the line between musical theater and glam rock. Despite the efforts of the high-energy cast, though, it’s difficult to connect to material that simply can’t be audibly understood.